photo by Nereo Zane Once again, Nereo sends us a great image from the world of voga-alla-Veneta. 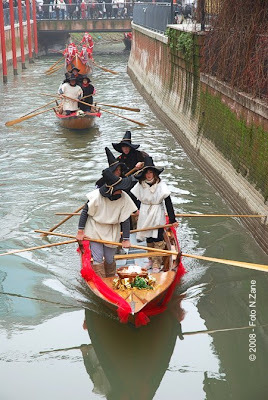 Here's a photo of a procession carried out by the GSVVM in Mestre. The boat in the front carries the baby Jesus on the bow, and the one at the back is rowed by a bunch of Santas. Oh, but they don't call him Santa in Italy - it's "Babbo Natale". There are more great photos there. While you're on Nereo's blog, check out his post on the Regata di S. Barbara - it ought to be titled "Caorlinas in the Mist". It makes me wish I'd been there.